When Mondo Ruled the Pop Art World! The next show opening at Mondo Gallery in Austin will be dedicated completely to Jurassic Park, just the first film, the 1993 Steven Spielberg Rated PG-13 dinosaur island masterpiece. Mondo has announced the new show called "When Dinosaurs Ruled the Earth", inspired by the banner in the lobby in the original film (see above), featuring tons of artists submitting all kinds of work inspired by Jurassic Park. The first piece can be seen below, by Francesco Francavilla, and of course it features the infamous Tyrannosaurus Rex. I can't wait to see all of the art, but we'll have to wait until June. 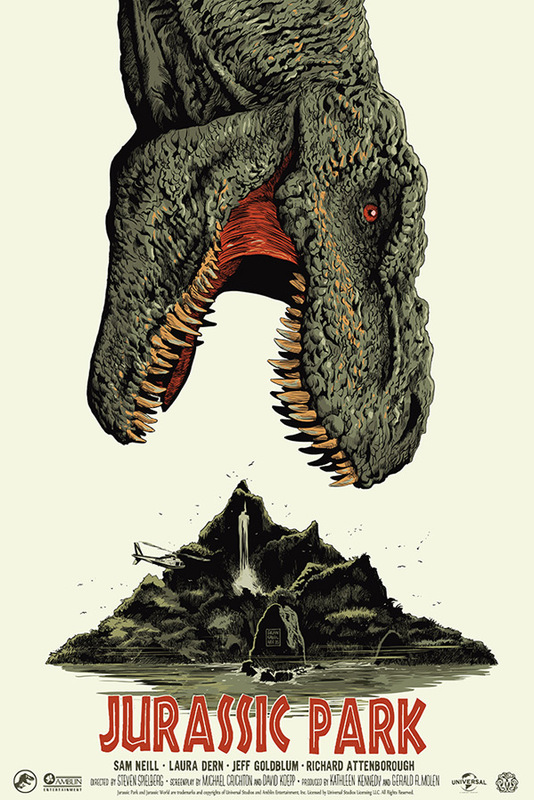 "Mondo's dino-sized gallery show celebrating Jurassic Park and the highly anticipated Jurassic World (in theaters June 12) will feature dozens of artists contributing original works of art and screen prints for one of the all time greatest blockbusters." The show opens at Mondo Gallery with a reception on the evening of June 12th, and runs from June 13th to June 27th. Located at 4115 Guadalupe Street, Austin, TX. "Hosting an entire gallery exhibit of new Jurassic Park artwork is a dream come true for us. It has been over 20 years since the first film captured the imagination of the entire planet and we hope to recreate some of the wonder and excitement of the franchise with this show," said Mondo CEO Justin Ismael. This is going to be epic. Aside from all the art and other goodies, they're also selling more of the Jurassic Park vinyl that sold out originally. For the full list of artists + more info on the show, visit mondotees.com. "Hold on to your butts." That poster is bananas. And bananas are good!